How polluted is my road? How polluted is my school? Parliament’s Environmental Audit Committee (EAC) has published today the Government’s response to the Committee’s Ninth Report of Session 2010-12 titled ‘Air quality: A follow-up report’. “The Environmental Audit Committee (EAC) is right to ‘rubbish’ the Government’s response to its hard-hitting inquiry into the Government’s failure to address the biggest public health crisis for decades. ‘Measures are in place to ensure regular advice is provided through LOCOG to the IOC on air quality at Games venues and also to the public.’ Paragraph 19 on page 5.“It seems the list of excuses is endless. In its response, the Government puts most emphasis on its new powers under the Localism Act 2011 to pass fines to local authorities. Repeatedly, the Government’s response focuses on short-term costs and challenges rather than the financial burden to society of up to £20 billion per year of continued inaction. “Astonishingly, the Government makes crystal clear it has no intention of complying with legally binding deadlines for nitrogen dioxide (paragraphs 22 and 23 on page 6) which have been in legislation since 1999 and required to be met by 2010. 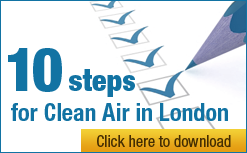 “It is laughable for the Government to say it is too costly to comply with air quality laws. Defra’s own Air Quality Strategy in 2007 stated, for example ‘policies in the road transport sector and the electricity generating sector have been shown to be very cost beneficial with benefits estimated to have exceeded costs by up to a factor of 24’ Note. It’s too costly not to comply with air quality laws. “Clean Air in London is very disappointed by the Government’s response today to the EAC’s latest inquiry into air quality. In particular, the long list of excuses and clear message that the Government has no intention of complying with air quality deadlines makes it impossible for CAL to continue as a member of the Government’s key stakeholder group on air quality. 26. Defra and the devolved administrations published ‘An Evaluation of the Air Quality Strategy’13 in January 2005. It evaluated selected air quality policies in the road transport and electricity generation sectors to assess their effectiveness in achieving air quality improvements. The report looked at policies between 1990-2001. However, due to the fact that the benefits of these policies extend far beyond this period, the analysis was also extended over a projected period between 2002- 2010. 27. It is clear from the evaluation report that policies in the road transport sector and the electricity generating sector have had a major impact in reducing air pollutant emissions and were shown to be very cost beneficial, with benefits estimated to have exceeded costs by up to a factor of 24. Of particular importance was the fitting of catalytic converters to motor vehicles and the increased use of gas to generate electricity. These had a major impact on improving air quality and ensuring progress towards the UK’s air quality objectives and European air quality limit values. They have also resulted in extremely large benefits to society by reducing the health and environmental impacts of air pollution, with road transport policies achieving benefits worth £2.9 to £18.4 billion and policies in the electricity generating sector achieving benefits worth £10.8 to £50.6 billion between 1990 and 2001. (The variation in these figures is largely the result of the uncertainty surrounding health impacts. Recent advances in the quantification of health benefits suggest that even the high end of this range of estimated of benefits is likely to underestimate the true benefit). The majority of these benefits were as a result of improvements in human health.